If you follow food blogs like I do you will have noticed the recent rhubarb craze. Everybody is making cakes, crumbles (or crisps as they like to call them on the other side of the ocean), muffins, ice-creams, tarts with rhubarb. I understand that in America there is quite a short rhubarb season, from April to September, which would justify why everyone goes absolutely mental about it, since it is so amazing! But here, thankfully, we have rhubarb almost all year round, and I am prepared to trust Gregg Wallace when he claims that rhubarb is in season all year apart from Autumn. My rhubarb obsession has resulted in an almost endless supply of rhubarb crumble all winter. Now that the spring/summer is here, I thought I might spice things up with a little strawberry. To prepare the filling, I chop up the rhubarb and boil it with some red wine until it becomes very soft and jam-like. Some people prefer it with some bite to it- I don’t. Rhubarb is very sour and usually takes a fair amount of sugar to make it edible. I don’t really follow a recipe and I like to add the sugar to the rhubarb at the end and taste it to see if it’s sweet enough. Brown sugar is definitely the way forward here. The strawberries are added after the rhubarb is cooked, and left it the pot to cook for as long as you want them- depending on whether you actually want whole fruit in your crumble or not. At that point the kitchen smells amazing and I would happily eat the whole thing without the topping. Actually, it goes great with just a bit of yogurt. You can add some chopped out ground nuts like almonds for some more texture/taste. 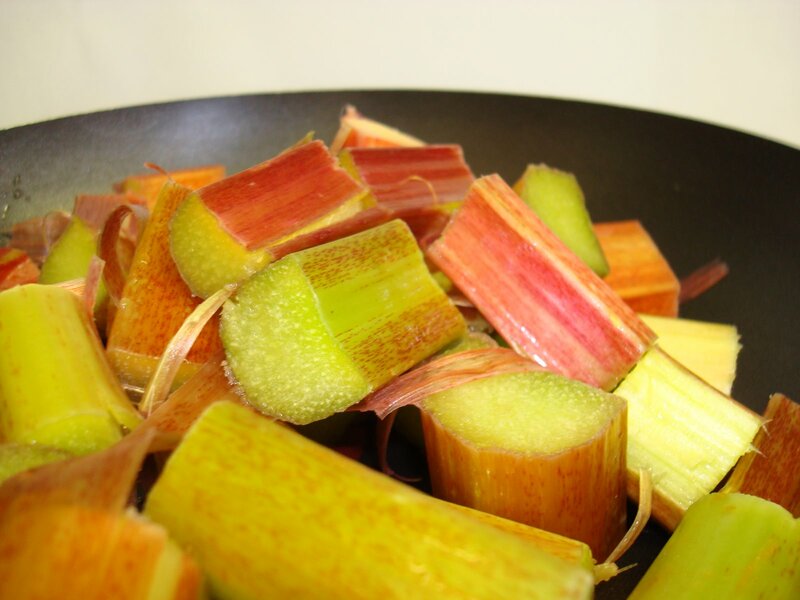 The amount of topping is usually enough for 4-5 stalks of rhubarb, depending on their size. Bake for as much as you can really, before it burns, because the topping will just get nicer with time. Half an hour is a minimum I usually find, if you want to avoid a floury crumble. You can serve it with either cream or custard, and I even like it with some greek yogurt, especially if the filling is a bit on the sweet side.